The explosion on Twitter Sunday morning in regards to comments made by Newark, N.J. mayor Cory Booker prompted me to watch the rebroadcast of “Meet the Press” Sunday afternoon. While I agree Booker went off message, I’m not ready to throw the baby out with the bathwater, like some. The criticisms of Booker are unwarranted. The man made a mistake. It happens. Move on. But no – listening to the “talking heads” on MSNBC last night – something I rarely do – one would have thought the man had committed a crime. With “friends” like these, who needs enemies? Um pot meet kettle @KrystalBall1 You promote yourself as much on Twitter as anyone. 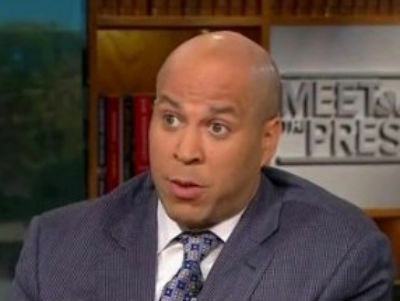 If there is anything that has been nauseating in the last couple of days, it’s the treatment of Booker by the likes of Ball and some of the others at MSNBC. Give it a rest. I agree with you, maybe because I know NJ well and “get” Newark and the suburbs of Essex, Passaic and Bergen Counties where many investment professionals work. Last night I heard the comment that Booker was “freelancing” and I agree with that too. He was a poor choice to represent Obama/Biden, but if all Dems toed the party line, we’d be Repubs. Oops. I meant “where many investment professionals live. I listened to what Booker said, and have to say I agreed with him. I didn’t see the entirety of the Meet the Press interview, but what I took away was that Obama has to steer clear of the broad brush against venture capital. Unless he seeks to lose the Independent voters. My wife and I were talking and we are already over the general election, with the ads that are running now. I can’t imagine what we will feel in 5 1/2 months. Could be more aptly titled, “sometimes telling the truth happens.” Sure it was a mistake to go off message, but what he said is absolutely right. Now you’ve got Ed Rendell and Mark Warner both saying essentially the same thing; that Obama’s tact on Bain Capital is not the best idea by a long shot.